Tizzy Bac have few slow ballads. This one is probably my favourite one. Not in the least for its very well written lyrics, even for Huiting’s (the lady keyboardist, vocalist and songwriter) exemplary standards. Very satisfying to have a rock band with such unique and distinctive and avant garde sounds, write lyrics in a polished literary style, and applying a classical rhyming scheme. and which probably with this minimalist treatment, coolly clarified even clearer and brighter still. This song starts right into the chorus, and the intro bar is essential. Piano rock has never sounded this good. Who can I look for to return it to me? How can I prove that I did no wrong? Tizzy Bac: Dear baby, where is my wing? Piano jazz? Rhythmic jazz rock? Dear baby, where is my wing? Where can I find my wings to fly in the sky? Where can I find my wings to see the rainbow crossing the sky? And what a fantastic ‘winging-it’ ending. 2-4-2 ‘distorted-mid-quad’ piano riffs on the last eight. One of their biggest hits. and just as wonderful lyrics. And psychotic evil genius technicolour villains. Even without the big hair. Hey dear,am I a joke? This song truly captures the essence of Tizzy Bac’s style of alternative piano rock, demonstrating what they can do with just keyboards, bass and percussions; and most delightfuly, showing their unique taiwanese flavour and vernacular. 抽筋的胃 – Cramping Stomach was originally recorded as a Mandarin song, but Tizzy Bac came up with an informal version in the Taiwanese/South-eastern Chinese dialect, Hokkien, which they played to rapturous response at their smaller scale concerts and performances. While the Taiwanese dialect (Hokkien) version of Cramping Stomach sports lyrics that seem a tad coarse and simple when compared to the prettier and more complex Mandarin lyrics, it truly has a earthy homegrown flavour which matches perfectly the eclectic off-beat beat of this indie tune. (Video has bad sound quality, am showing it just for the intro. [Honestly, whenever I hear this tune, I can’t help but bob along and move my shoulders like Hui-Ting in the clip… only this time, sending cramping pain down my spasming back. [Hui-ting, the keyboardist and vocalist, sings the Hokkien lyrics in such a curious, lilting, airy manner. Very different from her delivery of the original song in mandarin. And this is why discerning TB fans actually prefer this unofficial live-concert-only Hokkien version over the official recorded Mandarin song. (Good sound quality, but unfortunately truncated; starting in the 2nd verse and without the fun intro. While spending time flat out on my back resting, and in an effort to not become over-dependent on painkillers+muscle relaxants for the pain, I have been trying some ‘alternative’ remedies for pain relief: listening to some of my favourite music. And one band and it’s music has proved to be particularly soothing for my doozy back, the Taiwanese alternative-rock band, Tizzy Bac. 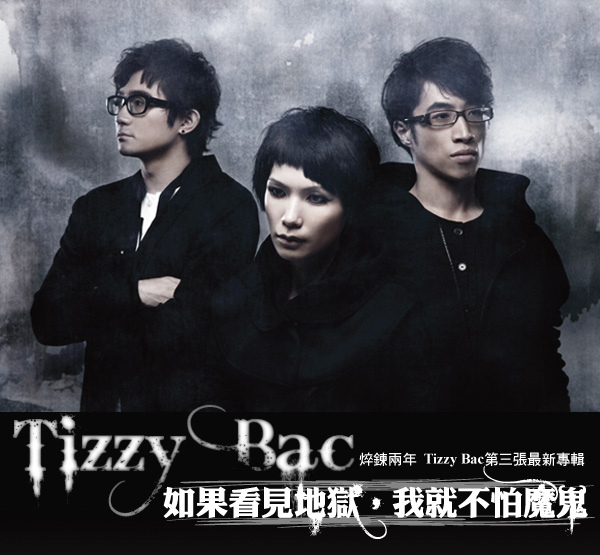 Tizzy Bac was composed of college literature students in Taiwan in December 1999. At first, the trio was only curious about how far a band without guitars could reach, and then, in April 2000, they played their first gig in the “Spring Screen” festival. Following their debut, which drew much attention, they were awarded the No.1 prize in the 2002 Hohaiyan Rock Festival, the biggest battle of bands competition in Taiwan at that time. Different from an ordinary band, Tizzy Bac has no guitarist. All guitar effects such as distortion/overdrive are made by bass. Piano/keyboard is the mainstream of their arrangements, and thus they are well known as a “piano rock” band. Tizzy Bac has been a secret addiction of mine for some time now. And on towards the titled song of this post: 淺色的那條 – That Pale Pair. The seemingly light lyrics and main melody is a veil behind which is a complex and multi-layered song. would you say miss me? oh would you miss me? But the jeans? That pale pair? Take me back again to those old familiar childhood scenes – Bicycle! would you say you miss me?